The Martin Appliance store in Myerstown, one of the retail locations in Lancaster, Lebanon, and Berks counties. Forty-one years ago, Dennis Martin started an appliance-repair business in a 200-square-foot garage in Myerstown, Pa. It didn’t take him long to understand the damaging effects that water—especially hard water or water with high levels of iron in it—could have on appliances like washers or dish washers. So Martin expanded the business to include water treatment service. It was the only way to provide customer satisfaction, which was paramount to the company even then. 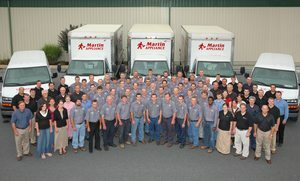 Within six years of that modest beginning, a Martin retail store was built along Route 422 just east of Myerstown, and the customer base continued to expand—as did Martin Appliance’s reputation for delivering excellent service. New stores were added in Lancaster, Lebanon, and Berks counties. The commitment to customer service that allowed the business to prosper four decades ago is still a guiding principle for the company today. In other words, when a customer buys an appliance, furniture, or a mattress from the Martin organization, there is a relationship being formed. customer who walks through one of Martin’s retail stores. With each satisfied customer, the company’s reputation is extended further and further. “We now have six retail locations,” said Reimold, noting that the most recent addition to the family is in Reading, Pa.
Appliances are still a cornerstone of the business, and each Martin Appliance location sells a full range of appliances for the home. “We have 40 major brands of appliances, and we typically display over 400 appliances in each showroom,” Reimold explained. Showrooms have live kitchens and sometimes chefs are brought in for cooking demonstrations. One popular product right now is the G.E. water heater, which is energy efficient and operates for about $200 per year instead of $500. There is free delivery for appliances, and the delivery person will also remove old appliances. The Martin showrooms at Quarryville and Ephrata also feature a variety of furniture choices. According to Reimold, customers will find a broad selection of reclining chairs starting at $300, as well as top-of-the-line recliners, and a price to fit every budget. “We carry a number of major brands to choose from,” he said. Reimold said that the Quarryville store’s mattress showroom was recently remodeled, and a remodel is currently underway at the Ephrata store. Just as with the furniture, there is a wide range of mattresses available, from $200 to $300 basic mattresses to higher-end products. Reimold added that they offer in-home design service and trained representatives will come to the home with color and fabric samples to help a customer plan out furniture purchases in a no-hassle, no-pressure way. There is typically an $80 charge for this service, but it is refunded in full with a purchase.“Our representatives can go out and lay out a floor plan and make sure that everything flows and looks good,” he explained. Reimold said that the services provided by Martin Water Conditioning are still very much in demand as concerns about the quality of water have increased steadily over the years. “People want to make sure that their water is safe first of all, and then they want to make sure that the water is good for the appliances,” Reimold explained. Employees who provide Martin Water Conditioning’s services are certified master technicians so customers will always be taken care of by experts in the field. Because no two wells are the same, Martin Water Conditioning provides free on-site testing and the technicians will make an honest recommendation so that the customer can make a decision about how to improve the water quality. “We have affordable water solutions for any condition,” Reimold said, explaining that in some cases it might cost as little as $200 to find a solution. 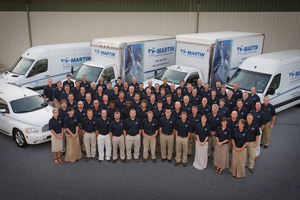 Although the Martin showroom locations are centered in Lebanon, Lancaster, and Berks counties, Martins have a network of service employees providing Appliance and Water services in South Eastern portion of Pennsylvania and Northern Maryland. In keeping with the company’s goal of guaranteeing customer satisfaction, Martin Appliance offers twelve-month, interest-free financing. “We’re not high-pressure,” Reimold said. “We like to be friends before we have a business relationship. Our sign says that we provide customer service the old-fashioned way. We don’t want anybody to be dissatisfied. That’s the kind of company that we are." Tues, Thurs, and Fri: 8 a.m. to 8 p.m.
Saturday: 9 a.m.to 3 p.m.